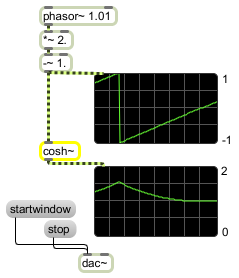 cosh~ will take any given signal and output a signal which is the hyperbolic cosine function of each sample within the input signal. signal Input to a hyperbolic cosine function. signal: The hyperbolic cosine of the input.